Sleep apnea is a very serious sleep disorder in which one stops breathing repeatedly while sleeping. These pauses in breathing can have a duration of several seconds to several minutes, and they can occur up to 30 times or more per hour. When you have disruptions in your breathing, there is an imbalance between the oxygen and carbon dioxide levels in your blood; normally these levels are regulated by breathing because you inhale oxygen and exhale carbon dioxide. Realizing that this imbalance exists, your brain will freak out and try to wake your body up so you can resume breathing normally. Patients who suffer from sleep apnea become partially awake when they are gasping for air, but since they are not fully awake they do not realize that there is a problem. Many people’s sleep apnea is diagnosed because a partner is concerned about their excessively loud snoring and/or choking sounds that they make while sleeping. Others are never diagnosed at all, which can be potentially life-threatening. Obstructive sleep apnea – the more common type of sleep apnea, this type occurs when the body tries to breathe but something is blocking the airflow to the nose and/or mouth. This type of sleep apnea can be treated by your Empress Walk Dental dentist. Why Is It So Important to Treat Sleep Apnea? Sleep apnea can be very dangerous for those who suffer from it because their breathing may be stopping completely several times an hour due to the obstruction caused by their soft throat tissues. Typically, the patient’s tongue will fall backward into the throat as well, creating even more blockage and impeding the lungs from getting the oxygen they need. At this point, the patient’s heart, abdomen, and diaphragm will all attempt to force the body to breathe. The effort these muscles expend trying to get more oxygen actually make the blockage even worse. All of this wakes the patient up because they have to move their tongue back to the front of their mouth and open up the back of their throat in order to breathe. While this is going on, the levels of carbon dioxide in the blood are shooting up, and the levels of oxygen are dropping. This phenomenon forces the heart to work very hard to provide enough blood to make up for the lack of oxygen. In fact, sleep apnea sufferers technically experience periods of “death” throughout the time they are asleep each night. Over the course of time, this puts a lot of strain on the heart, and it can result in the development of various serious heart conditions. If you suspect that you or a loved one might have sleep apnea, it is very important that you mention it to your dentist as soon as possible so that further evaluation can be done. The first step to being treated for sleep apnea is to get an official diagnosis from a sleep medicine specialist (physician). At that point, your sleep doctor and your dentist will work together to determine the best course of treatment for you. Depending upon the patient’s health and the severity of the sleep apnea, the dentist may be able to offer several different treatment options. Oftentimes, lifestyle changes are the first line of defense against sleep apnea. Your Empress Walk Dental dentist may suggest that you quit smoking, using tranquilizers, and drinking alcohol, all of which can make sleep apnea worse. The traditional treatment for sleep apnea has been the use of sleep masks, which keep the patient’s airways open while they are sleeping. More recently, dental devices have been developed to keep the lower jaw in a forward position, which in turn prevents the tongue from cutting off the air flow to the lungs. This is an ideal treatment option for many patients because it is a simple, gentle, nonsurgical treatment. Several different dental devices exist to help with obstructive sleep apnea. They work by repositioning the jaws so that they are more forward, which opens up the patient’s airway so that the oxygen can flow unimpeded. These devices can alleviate the symptoms of sleep apnea so that patients don’t snore loudly, get a good night’s rest and don’t fall asleep throughout the day, and can fall asleep more comfortably at night. Patients who are not significantly overweight experience the most relief of their sleep apnea symptoms by using dental devices. For these patients, these devices are a good alternative to using a Continuous Positive Airway Pressure (CPAP) machine. 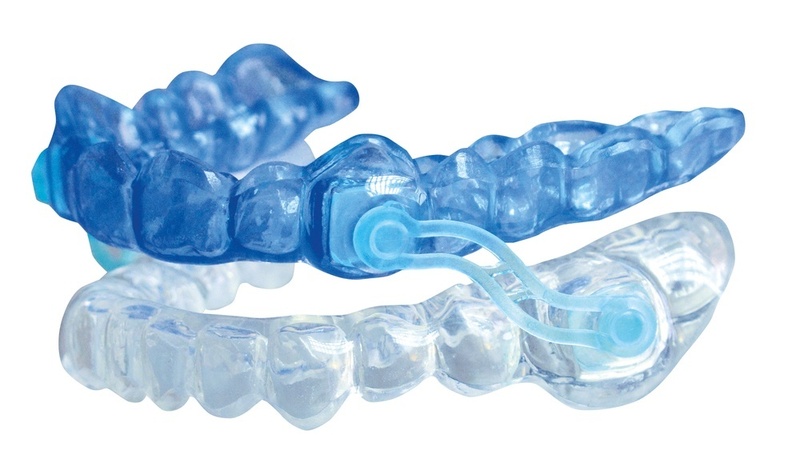 Sleep apnea dental devices come in two different varieties: adjustable and fixed. Your Empress Walk Dental dentist will recommend the appliance that is best for you depending upon your individual situation. If you have questions about obstructive sleep apnea or think you might qualify for a sleep apnea diagnosis, please call or contact Empress Walk Dental today at 416-250-8000 to schedule your consultation at one of our convenient Toronto or North York locations.